7/17 Cup of Coffee: Salem, Lowell and the DSL Red Sox won on the strength of their bats. The Drive fell, and the GCL Red Sox dropped both halves of a doubleheader. Portland and Pawtucket were not in action. The Salem Red Sox defeated the Frederick Keys (BAL) 8-5 in a slugfest. Each team collected 11 hits in the game. Eight of the 10 Salem Red Sox who saw action collected a hit. Left fielder Kevin Heller had an especially remarkable day going 3 for 3 with a run, a double and an RBI after replacing Kendrick Perkins in the fifth inning. Third baseman Mario Martinez was 2 for 4 with two RBI in the game. Starter Justin Haley pitched well and staying into the fifth inning before being lifted for a reliever. In 5 1/3 innings, Haley yielded three hits, two walks, two earned runs and struck out six batters. The Lowell Spinners defeated the Batavia Muckdogs (MIA) 6-4. The Spinners opened the scoring with two runs in the top of the first inning. Those runs came on first baseman Sam Travis's (Pictured, above) two-run home run, his third of the season. Batavia would tie it in the bottom of the second inning only to see Lowell jump back out in front in the top of the fourth. Eventually, Batavia took a 4-3 lead, which it held until the eighth inning. In the eighth, Lowell scored two runs on a fielding error and a groundout. The bizarre inning ended when Nick Moore was thrown out at home on an infield single by Deiner Lopez. Lowell starter Reed Reilly lasted only three innings, but was solid. He gave up one earned run, two hits and struck out four on the day. Reliever Heri Quevedo was impressive in five innings of work. Quevedo struck out eight batters and yielded only four hits and two earned runs. The Greenville Drive fell to the Rome Braves (ATL) 5-2. It was a bit of a sloppy contest as there were five errors between both teams. The Drive were also only able to scratch across four hits in the game, which contributed to the loss. Those four hits were shared by two men: right fielder Franklin Guzman and catcher Carlos Coste, who were both 2 for 4. Three Drive pitchers appeared in the game: starter Jamie Callahan, who gave up four runs, three earned, in the first three innings; German Taveras, who surrendered one run on four hits in his three innings, and Taylor Grover, who struck out five and gave up one hit and no runs in the final two innings. The DSL Red Sox defeated the DSL Nationals 13-4. The score is not a true indicator of how close the game was as times as the Red Sox scored six runs in the ninth inning. The Red Sox did open up to an early lead, however, scoring five runs in the bottom of the first inning. The scoring began with an RBI double from Roldani Baldwin with one out. Another run came home on a bases loaded walk a few batters later. Then Rafael Toribio singled with the bases loaded to plate two more runs. The scoring was capped home when Jesus Perez stole home on what appeared to be a double-steal. 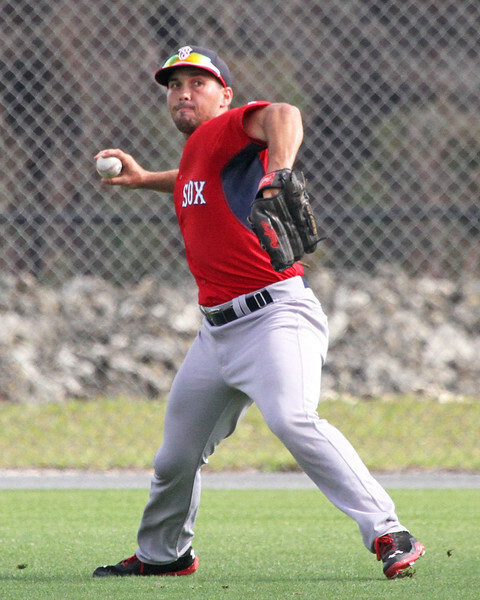 Daniel Gonzalez started for the Red Sox. He gave up seven hits, two walks and four earned runs in four innings. The GCL Red Sox dropped both halves of a doubleheader to the GCL Orioles. They fell 5-2 in the first contest and 6-0 in the second contest. In the first seven-inning game, the GCL Red Sox collected five hits scattered among five players. Catcher Jhon Nunez, who was 1 for 1 as a replacement player, and first baseman Josh Ockimey, who was 0 for 3, collected one RBI each. Dedgar Jimenez started the first game and threw 3 2/3 innings. In the outing, he gave up four runs, two earned, and struck out four. The second game was tied at zero at the end of four. The Orioles would go on to score two runs in each of the final three innings. The team had only five hits, two of which came from designated hitter Javier Guerra, who was 2 for 3 with a double. Five players, four from Portland and one from Pawtucket, represented the organization in two Minor League All-Star games played Wednesday: Sean Coyle, an infielder in Portland; Blake Swihart, Portland's catcher; Derrick Gibson, an infielder in Portland; Robby Scott, a left-handed reliever with Portland, and Tommy Layne, a left-handed reliever with Pawtucket. Noe Ramirez, a reliever in Portland, was selected as an All-Star, but did not play last night. The Portland players played in the Eastern League All-Star game for the Eastern Division All-Stars, while Layne played on the International League All-Stars against the Pacific Coast League All-Stars. In the Eastern League contest, the East fell to the West 5-2. Gibson hit ninth for the East team, but was the best hitter in the lineup that night. Gibson, who played the entire game at shortstop, went 2 for 3 with a triple, a home run, two runs scored, one RBI and a walk. Coyle played second base and led off for the East. He was 1 for 3 before being replaced. Swihart hit third and was 0 for 2 before being replaced. Scott pitched one inning in relief and struck out two batters without giving up a run. The International League team defeated the Pacific Coast League team 7-3. Layne pitched one clean inning in relief surrendering no hits or walks and striking out one batter. Player of the Day: On a day where standouts were few and far between, Salem outfielder Kevin Heller (Pictured) proved himself worthy of the honor. Heller was 3 for 3 with a run, double and RBI in Salem's win over the Frederick Keys. Heller, 24, has produced a .265/.388/.409 triple slash line in Salem. 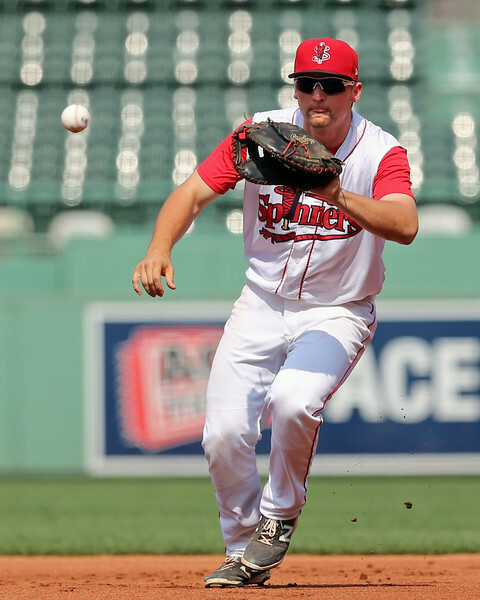 Photos: Sam Travis and Kevin Heller by Kelly O'Connor.